Drawing from observation is observing the real thing as you complete a drawing. This is likely very different from what you are accustomed, and yes, more challenging compared to drawing from images found on the internet or elsewhere, but the rewards are great when practiced. Artists often create much better art pieces when they draw this way. Why? because we see more, sense more of our subjects when they are directly in front of us. We are also forced to think more, develop more, create more, and be original because we have to plan what will be in the composition. We have to think about positioning, angle of view, supporting (negative) space, and the very important shadows & highlights. These are all creative decisions and considerations lost, when artists copy images made by other people. Cameras do have a place in art, but IB students should be aware of their limitations in regard as sources for drawings and paintings. Even if you take your own photos, remember that they are in themselves 2-dimensional images of 3-D objects, so drawings and paintings made from them can appear flat. The greatest advantage of drawing from observation is that the finished art piece is a 100% original. It also gives you much more information compared to drawing from a photo. Viewing the real thing directly in front of you, with the correct lighting, enables you to perceive depth, volume and form much greater than compared to drawing from a photo. The exercise of drawing from observation is one of the most standard practices for artist development. Every major art school implies the exercise as part of its drawing curriculum. Students in art schools, are expected to perform anywhere from 10 to 100 of these per course. Some professional artists will for all their lives perform observation sketches in preparation of every single art piece they make. Working from observation can also be a dynamic activity as things can change in front of you. 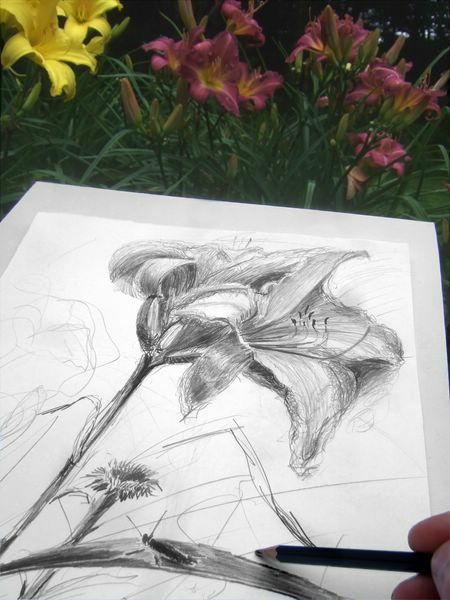 While sketching the lilies for this article, a grasshopper landed on a leaf, keeping me company during the sketch. He eventually became more interesting than the flowers, and the focal point of the drawing. Pencil drawings range from sketches to complete drawings that are art pieces in themselves. How far you take your drawing is up to you. For your workbook include drawings that work towards the development of your finished art pieces. Approach drawing as a way to develop and improve art skills. Your first attempts may not be as successful as you would like, but do not give up. Your drawings will improve with practice, and as they do, so will your art making. Find subjects and locations that interest you. Allot enough time to fully relax and enjoy what you are doing. Understanding the use of lighting is extremely important for creating great images. Artists should take advantage of the sun whenever possible during outdoor drawing exercises. By all means draw whenever the mood strikes you but the best lighting outdoors for conveying form, shadows and highlights is early morning or late afternoon when the sun is low in the sky. Actual hours vary depending on summer and winter seasons. For indoor drawing, Dutch masters like Rembrandt and Vermeer used to arrange their subjects near windows to allow for light to shine in on them, creating the necessary highlight and shadow areas.